Dr. David Constantine is the creator of "The Big List". 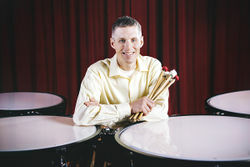 In what started as a quest to find the lineage of timpanists with certain orchestra, transformed into a research topic to identify all the timpanists who play and have played within the major symphony orchestras throughout the United States. This soon became a resource that was interesting to many people as they would add and further contribute dates and names to the project. The idea has grown yet further to begin including international orchestras as well. The TEK Percussion Database seems a good place for the list and information to grow and be edited by users who care about this information. This page was last modified on 21 November 2013, at 18:06.